I have heard back from the University and there are 10 cafes plus the canteen, we can access all, so I hope you are ok with the group explore this coming Wednesday to establish a new route and stop. I do not have sufficient time to always do this myself, over the next two weeks I have 3 days booked out on group activities and that does not include support for Richard Monk on Mondays as I am helping Pam. I may not be able too make this coming Friday, Alan will lead the ride. Those of you who have had flyers would you pleas advise by email where you have managed to place them. Angela and Harry are both well and I have heard from Alfred so he may be out soon. We are seeing some new members and people are approaching us regularly at Leasureworld while we wait to depart, this is positive. This entry was posted in Rides on April 28, 2018 by cfprideleader. Wednesdays new route got of to a slow start and the Hospital Arms food options/price where disappointing. The next time we do the ride we will do two laps of Abbey Field at your own pace and the stop will be at the new cafe that replaced the greengrocers. Friday Groups ride to Munning’s was a record turnout an enjoyable ride on the last day of summer. 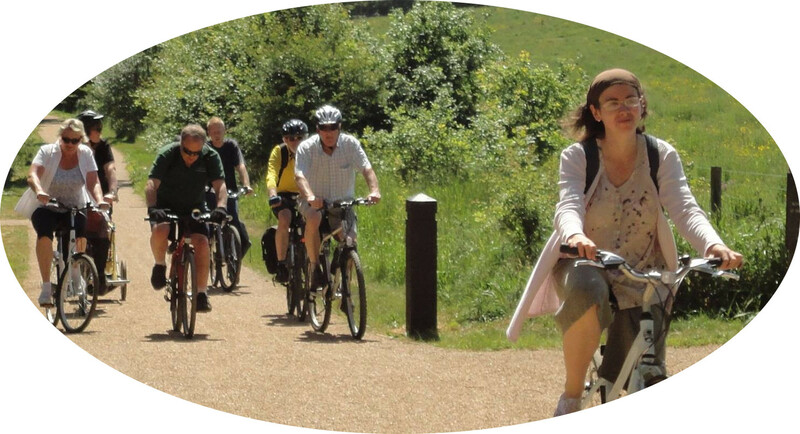 Wednesday we have a new destination with a mix of new and old routes, we will ride up through the park through Abbey Gates and around the garrison area arriving for lunch at the Hospital Arms, the return trip will be through the centre of Lexden returning via Hilly Fields and then back to the park. Fridays ride this week will be to Abberton, we may alter the route. Wednesday the 2nd May we will try something completely different, the group will split into two and head via different routes to the University, each group will explore the options for Coffee etc and then we will meet up to review and finalise the new ride/destination. This entry was posted in Rides on April 23, 2018 by cfprideleader. The official indicator of BST arrival i.e. Val Williams on a Wednesday ride. In addition we had one returning and one new lady Dona from Leasureworld who will be out on a 4 week cycle. Tomorrow 20th we are heading to Munnings. There is a positive response to the Sudbury ride on 22nd June, I have checked and there is no charge for bicycles on the return train journey. This entry was posted in Rides on April 19, 2018 by cfprideleader. Friday we will ride to Munnings. The first Friday long ride will be on June 20th cycling to Sudbury returning by train to Marks Tey. If you wish to ride would you please fill in the contact form last page on the site so I can make arrangements. This entry was posted in Rides on April 14, 2018 by cfprideleader. The A.G.M. took place at Leisureworld on 11th April with 5 committee members present and 3 members from the group, there were no apologise of absence. The main items raised were the substantial loss of female riders. The current committee resigned on block as all were willing to stand for a third term duly re-elected. Under any other business the following was debated. HealthyHandlebars, Richard Monk’s new venture. The committee continues to operate without a secretary. Wednesday 11th after the ride to Oaktree Cafe we will head back to LeasureWorld for our AGM. This is your opportunity to make suggestions or complain about how the group is run, please use it. The Friday B Group ventures further afield with rides 24 mile plus beyond the scope of Wednesdays, there has been a request for occasional longer ride, it is proposed that in June, July and August we run a longer day ride. Three suggestions below, would you please use the contact form to indicate which if any of the rides you would undertake together with any other destinations. This entry was posted in Rides on April 9, 2018 by cfprideleader.